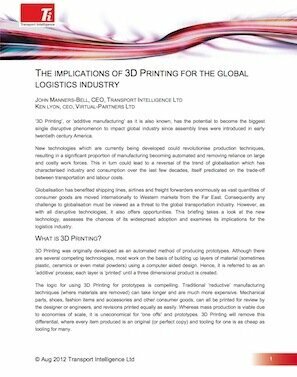 In a new white paper entitled, The Implications of 3D Printing for the Global Logistics Industry, authors John Manners-Bell, CEO of Transport Intelligence and technology innovator Ken Lyon explain how 3D printing has the potential to be the “biggest single disruptive phenomenon” to disrupt the global logistics industry since the assembly line. The report examines how 3D printing (additive manufacturing) will revolutionize production techniques, which will threaten the global transportation and logistics industry, reversing the march of globalization we’ve seen for the last few decades. We often tend to focus on what 3D printing is doing to manufacturing, and not quite as much on the massive industry that is built around it–the moving of raw materials, parts and finished products around the world. In this respect, the white paper is an eye-opener. “3D Printing, combined with efficient manufacturing, will revolutionise the principles established in the first Industrial Revolution. Not only will local manufacturing re-establish itself close to end markets, but it will allow the flexibility to reconfigure in response to changing consumer demands. The nature of manufacturing will be very different from traditional models in which it takes established production plants months (or even years) to retool. “The philosophy of manufacturing in which products are made precisely to customer demand could have big implications in certain sectors. For instance, in the healthcare vertical small ‘one-off’ production runs of drugs/compounds will reduce inventory holding costs. But this capability will also enable the rapid transport of entire production plants to areas where large amounts of drugs may be needed in times of emergency (i.e. pandemics or natural disasters). The paper then focuses on the implications of the new manufacturing technology on the global logistics industry, and they conclude they “could be massive.” Some of the negative outcomes for the industry are the reduction of shipping and air cargo volumes, falling inventory levels and warehousing needs, fewer opportunities for logistics suppliers to be involved in companies’ upstream supply chains, the closing of retail outlets, and either the transformation or the decimation of the service parts logistics sector. On a positive note, they see an opportunity in the moving and storage of raw materials for 3D printing. There is a lot more about the effect on the logistics industry in the report, so if you are interested in this, you can download the free white paper by clicking here. One tidbit that I found in the report that I thought was interesting is that they cite (without reference) that in 2012 already up to 30% of finished products already involve 3D printing in some manner; by 2016 this is to rise to 50%, and by 2020 perhaps up to 80%. I didn’t know we were at 30% already; however, when you consider prototyping as part of the manufacturing process, it makes sense.